A leading independent publisher of Genre Fiction, Pro Se Productions announces the release of the first in a previously self published series of mysteries by author John Achor. One-Two, Kill A Few: A Casey Fremont Mystery debuts the title character, a woman forced to take on the role of detective in order to unravel a web of danger around her and to save her own life. Struggling to recover from a disastrous marriage and contentious divorce, Casey Fremont would prefer to make ends meet with her paycheck from a temp job; but now her goal of personal and mental renewal becomes one of staying alive as she solves a riddle of murder and mayhem. Casey Fremont is on her way to interview for a temp job when a falling body nearly lands on her. Three days later, a second man, this one from her own office, dies in a similar manner and Casey is drawn into the intrigue. She confirms her suspicions, but one of her her friends ends up in the hands of kidnappers. Casey must solve the mystery before she becomes the third body to go over the railing. 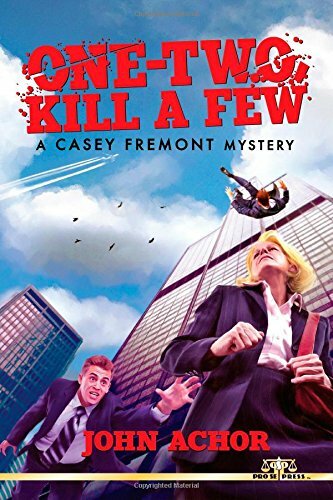 Author John Achor introduces amateur sleuth Casey Fremont in a newly released and re-edited edition of One-Two, Kill A Few: A Casey Fremont Mystery, the first in the Casey Fremont series from Pro Se Productions. Featuring a fantastic cover and logo design by Jeffrey Hayes and print formatting by Percival Constantine, One-Two, Kill A Few: A Casey Fremont Mystery is available in print at Amazon, Barnes & Noble and Pro Se’s own store at http://tinyurl.com/qeydwum for 15.00. The book is also available as an eBook, formatting and design by Russ Anderson, from Amazon for the Kindle and www.smashwords.com in various formats for only $2.99. For more information on this title, interviews with the authors, or digital copies for review, contact Morgan McKay, Pro Se’s Director of Corporate Operations, at directorofcorporateoperations@prose-press.com.